This time of year means back to school and the end of lazy summer mornings! Last week my 3-year-old started a little 3-day preschool program. So far he loves it so far! I know 3 hours at preschool is nothing compared to a full school day, but I still feel so much better sending him off after he eats a wholesome breakfast. Quick, healthy breakfasts are the solution for that. 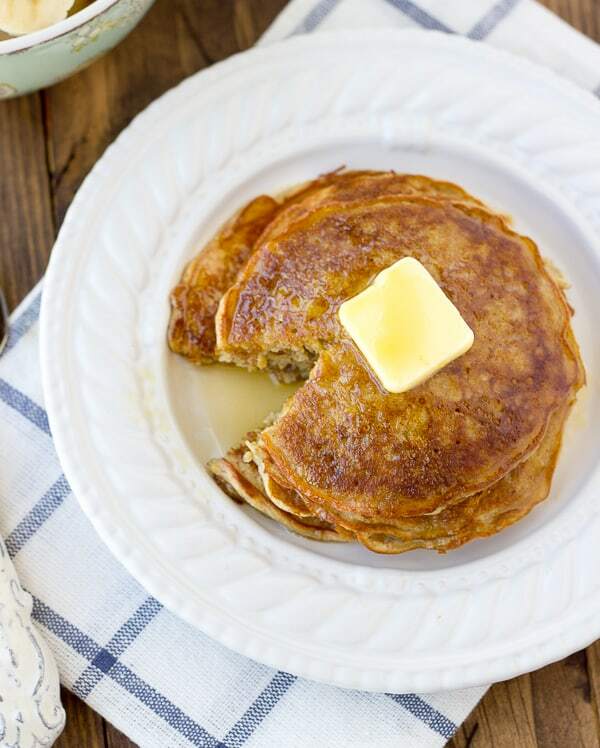 I made these pancakes earlier this week and they were a hit with both my son and husband. You make the batter the night before so all you have to do is griddle them up in the morning. 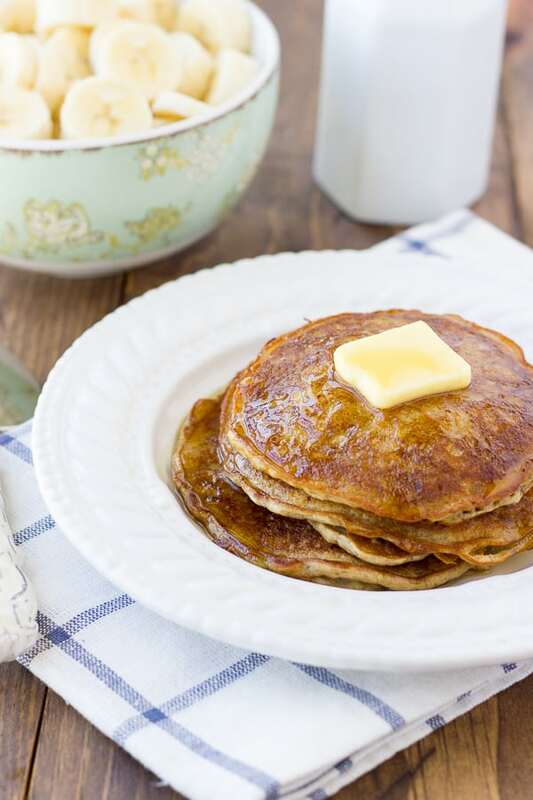 These pancakes are full of healthy ingredients and flavor. They are scented with cinnamon and vanilla and have the yummy nutty taste of oatmeal. My family and I all agree that they taste especially delicious with Justin’s Chocolate Hazelnut Spread (for less sugar and no dairy) or Nutella (for a treat!). These pancakes taste extra delicious with Justin’s Chocolate Hazelnut Spread (for dairy-free) or Nutella. 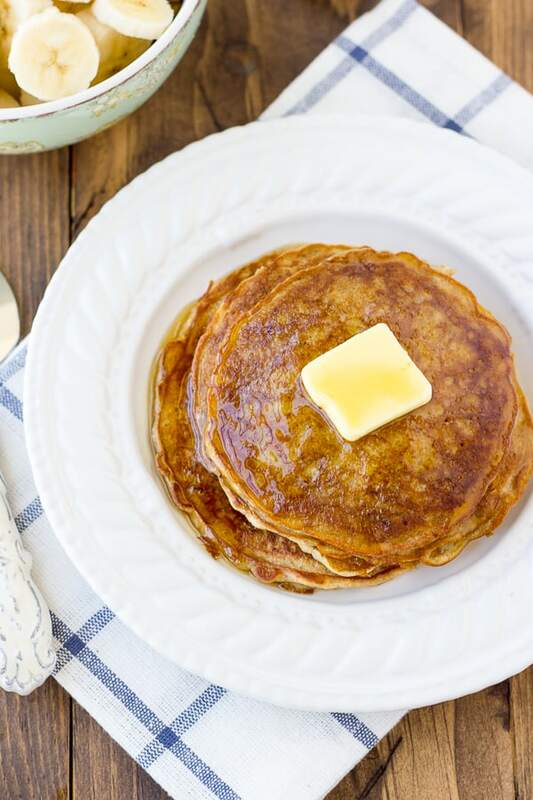 You can substitute the 1/2 cup brown rice flour + 1/4 cup potato starch for 3/4 cup of gluten-free all-purpose flour. I half this recipe for just my husband, son, and I. The night before, combine the dry ingredients in a large bowl. Whisk to combine then add the wet ingredients and mix until smooth. Cover with plastic wrap and refrigerate overnight. The batter will look thin, but will thicken as it sits. The next morning, heat a cast iron (or non-stick) pan over medium-high heat. You can also use a griddle to make more pancakes at once. Give the batter a good stir. 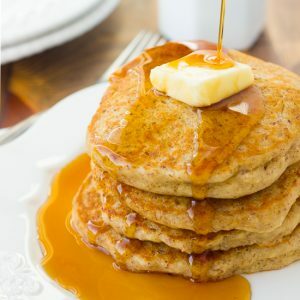 Once the pan is hot, oil it with a little coconut oil or butter and pour 1/3 cup of the batter per pancake into the pan. Once the centers of each pancake begin to bubble and the edges set, flip and cook for another 1-2 minutes on the other side. You can preheat the oven to 200F and place cooked pancakes on a rimmed baking sheet to keep them warm while you make the rest if you like. Serve hot with maple syrup, butter, berries, or our favorite, chocolate hazelnut spread! Delicious! I soaked mine overnight( without the honey and eggs) on the counter. Did not thicken up as much, but I just added some fresh milled buckwheat until I got the right consistency . We like ours with a sprinkle of enjoy life mini chips and maple syrup. Will make again. Anyone try making, freezing and reheating in the microwave??? Hi. I was wondering about using sprouted whole wheat flour instead of the Brown Rice flour. I know it’s a weight to weight conversion and not cup to cup but what about the tapioca starch? Would it be replaced as well like the conversion above the recipe? 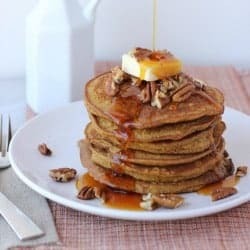 Would the wheat flour be the same as the all-purpose flour in that conversion mentioned? I hope this makes sense. The whole arsenic thing is a concern on the rice flour as well as it is higher in calories and fat.